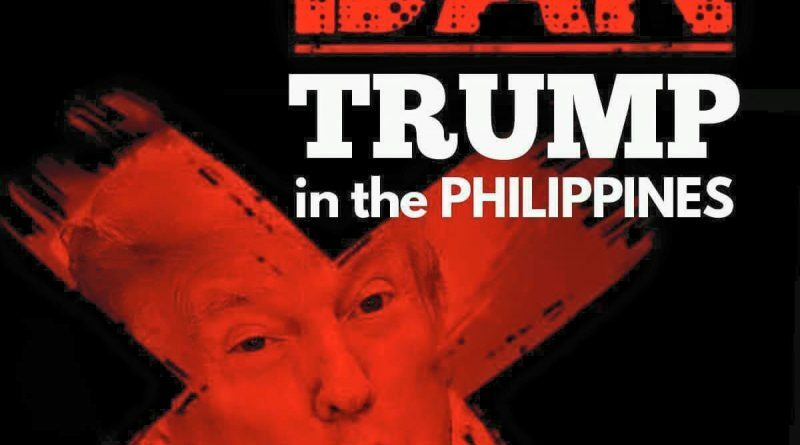 On November 12-13, US President Donald Trump, the racist and fascist CEO of US imperialism and enemy of the oppressed peoples of the world, will visit the Philippines as part of a 12-day Asian swing. He is set to attend the ASEAN-US Summit as well as hold bilateral meetings with leaders from different countries, including the Philippines. Trump’s visit comes a day before the East Asia Summit that will be attended by imperialist powers such as the US, China, Japan, Russia and Australia. Trump heads the world’s number one imperialist power that has brought death, misery and destruction to countries like the Philippines. He represents the interests of US monopoly capitalism and the military-industrial complex. Trump is widely rejected even in his own country. He has encouraged or promoted racism and anti-immigrant policies. He has banned the entry in the US of Muslims coming from countries considered as enemies of the US — countries that were in fact bombed or invaded by the US. His nearly one-year regime has worsened the Ultra Right, fascist, racist, militarist and interventionist character of the US government. The US is pushing hard its agenda in the ASEAN and the East Asia Summit. This includes the so-called “war on terror” against ISIS, an entity that had gained strength because of US destabilization of the Middle East. The US also wants to justify its intervention in North Korea and in the South China Sea. The US sees itself as a Pacific power and intends to maintain its hegemony in the region, and counter the rising power of China. The Trump visit will also mean the first meeting between the US President and Philippine President Rodrigo Duterte. Duterte himself has faced growing criticism over his bloody war on drugs, threats to impose a dictatorship, the scuttling of the peace talks, declaration of all-out war, the destruction of Marawi and his regime’s subservience to US dictates. Over the past few months, a broad front has emerged to challenge the anti-people and anti-national policies of the US-Duterte regime. Nothing beneficial is expected from the Trump visit to the Philippines. The meeting between Trump and Duterte is intended to reaffirm the grossly unequal relations between the US and the Philippines. Simply put, these relations are between an imperialist master and its neocolony. The US wants to maintain its position as the leading imperialist power in the Philippines and in the region, as it tries to contain the rise of China as an imperialist rival. Trump would seek to advance US economic interests in the Philippines by further opening up the economy to foreign investments and ownership. Trump and the US also want to expand its military bases in the Philippines through the Enhanced Defense Cooperation Agreement (EDCA), in tandem with the Visiting Forces Agreement (VFA). The permanent military presence of the US is being justified through the so-called “war on terror” that the US is supposedly waging against groups such as ISIS. In the first place, we have to point out that it is the US that is ultimately responsible for the rise of ISIS. The US merely uses the “war on terror” to justify its naked aggression and intervention in countries such as the Philippines. The US is now poised to carry out a “named-operation” in the Philippines similar to Operation: Enduring Freedom Philippines in 2002 wherein the Abu Sayyaf was used as pretext for establishing permanent US military presence in the country. The US “war on terror” has been exposed as a sham worldwide — from Afghanistan and Iraq to Syria and Libya. It has been used as a blank check to conduct wars of aggression, airstrikes on civilian communities and regime change operations. It had created far worse problems than those it claimed to solve. The planned US operation in the Philippines will violate national sovereignty and human rights. As in other countries, it seeks to allow direct US military intervention and involvement in combat operations, including unilateral drone strikes. After US military involvement in Marawi, the Trump regime seeks to expand its involvement in the Philippines. US military intervention should be rejected and opposed. Meanwhile, like vultures circling the dead, the US and other imperialist powers are all set to take advantage of the reconstruction of Marawi after its utter destruction by the Philippine government. Big business and foreign banks will take the lead in reconstruction and are expected to reshape Marawi along big business interests. Part of US intervention in the Philippines is support and funding for counter-insurgency operations that target movements against imperialism and its interests. The US does not want peace talks between the GRP and the NDFP to succeed since this will also undermine US influence in the country. The US does not want to see meaningful socio-economic reforms as this would counter the unequal economic relations between the US and the Philippines. Even while Duterte appears to have opened up to China and Russia, the Philippines continues to tow the US line on many strategic issues. There are intensifying contradictions among the imperialist powers on how they can maximize and increase their influence in the region. Meanwhile, there is also a part of the US ruling elite that is critical of Duterte’s “war on drugs” and Duterte views this as a possible external threat to his regime. The US-Duterte regime is the expression of the collusion of US imperialism and local puppets in power. This can be seen in the fields of economy, politics and the military. US imperialism and its lackeys work together to maintain the bankrupt semi-feudal and semi-colonial social system that has mired millions in poverty. They use state-sponsored violence to suppress the people fighting for change. The Philippine’s status as a neocolony is the reason why we have not developed and why we remain weak economically and militarily. Imperialist powers, such as those gathering in the East Asia Summit, take advantage of this weakness so that they can impose on our country. The Filipino people desire genuine freedom from any foreign dictates and intervention. This is a requisite for the Philippines to be able to chart its own path to progress. It is only through the assertion of sovereignty that the Philippines will be able to stand on its own two feet. It is time to end all forms of foreign intervention and unequal relations. It is time to place national interest above any foreign dictate. The time has come to uphold Philippine sovereignty against imperialism.